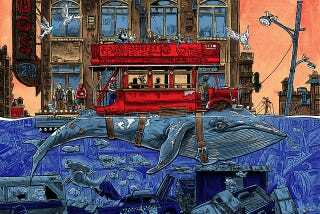 After the sea levels rose, the bus lines remained more or less the same, although it was difficult to keep the whales from veering off the route through a krill swarm. "Northbound Whale" is part of Tim Doyle's The Sea Also Rises series of prints, which are available from Nakatomi. Doyle is selling 200 limited edition screenprints of this piece for $50 each.